Qualcomm today has unveiled the Snapdragon 450 chipset. With the reception given smartphones like the BlackBerry KEYone and the Moto Z Play, both of which used the Snapdragon 625 SoC to help provide outstanding battery life, the new chip offers extremely efficient energy usage. In fact, the Snapdragon 450 is built using the same 14nm process as the Snapdragon 625 and recently announced 630 chipsets. That compares to the 28nm process that the Snapdragon 435 uses, and gives devices powered by the Snapdragon 450 chip four additional hours of battery life. A true octa-core CPU is found inside with eight Cortex-A53 cores running at a clock speed of 1.8GHz. The Adreno 506 GPU provides a 25% improvement in speed over the Adreno 505 GPU found on the Snapdragon 435 SoC. That is due to the small improvement in clock speed, and some thermal benefits. The Snapdragon 450 chipset also supports video streaming at 60fps, twice the speed supported by the Snapdragon 435. The new chip is compatible with a dual camera setup supporting a pair of 13MP snappers. That makes it the first 400 series chipset to offer support for Bokeh photography. Quick Charge 3.0 works with the Snapdragon 450, and displays with resolution of 1080 x 1920 and lower are supported. With the X9 baseband chip, download speeds up to 300Mbps will run on the Snapdragon 450. "We’ve made many recent changes to the Snapdragon Mobile Platforms as part of our vision to deliver the most advanced mobile functionality at the best possible value, and the Snapdragon 450 Mobile Platform is another realization of that vision. 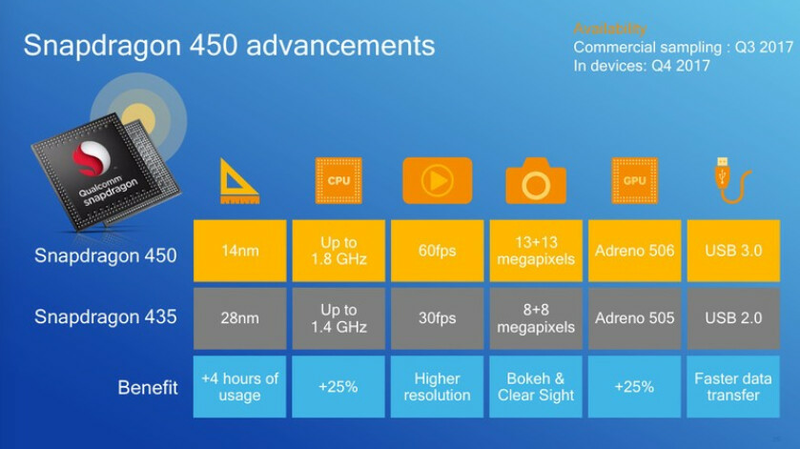 With the Snapdragon 450, users are going to see a dramatically improved level of performance, connectivity, battery life and imaging performance. "-Kedar Kondap, vice president, product management, Qualcomm Technologies, Inc.
Devices powered by the Snapdragon 450 will start shipping in the fourth quarter of this year. wow nice spec for an entry level chip! definitelty a huge improvent over the last generation. Hmmm. This is what I've been waiting for but all those improvements may be too costly. I imagine it won't make it in a phone for under $200 for at least the 1st year :/ I'd like to see an even more entry level chip made on 14nm. I'd be good w/o all those features if it could make it in a phone around $100. A 720, 5" screen would last Days!